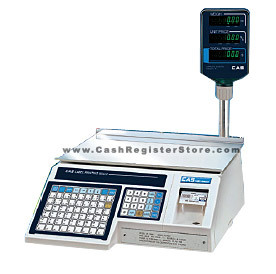 CAS LP-1000NP Electronic Weight Scales at Cash Register Store.com. The CAS LP-1000N is the best scale on the market today in its class. A feature rich, easy-to-use label printing scale. With its ability to use the most popular label formats, the LP-1000N will be perfect for deli�s, convenience stores, grocery stores, etc. To speed programming time, every CAS LP-1000NP scale sold includes FREE PC-to-scale programming software. Yes, install the software on your PC and have your scale up and running in no time. If you do not have a computer to program the scale, you can still program via the scale keypad. To view various barcode labels for ingredient list and safe handling, download the brochure at the link below.